Camp Lemieux began in 1950 with a vision of Reverend Richard Lariviere to provide a summer camp for Catholic youth in the former Diocese of Gravelbourg. Camp Lemieux is located on the west shore of Lac Pelletier south of Swift Current, Saskatchewan. We nurture the faith of youth through a Catholic Christian community, participation in the sacraments, and new experiences in an outdoor setting. Our program has a balance of fun, recreation, life skills and faith teachings. Campers are challenged to worship and love the Lord our God with all our heart, soul, and strength. Between 2012 and 2017 registrations at Camp Lemieux consistently fell below 100 campers per summer, with ever increasing reliance on sponsorship to attend camp. Our historical model of only employing summer staff is no longer sustainable. With renewed effort this 2018 camp season, 170 youth between the ages of six and seventeen were welcomed and invited to grow in their faith while creating lasting memories with their friends. With your help, we are reflecting on current practices, responding to changing ministry needs, and changing the way we run. All to ensure a future for the next generation of faith and fun at Camp Lemieux. The “Sharing our Faith. Securing our Future” campaign has been established to increase Camp Lemieux’s capacity ensuring our presence for future generations of youth. This campaign will focus on the following goals until the summer of 2020. Capital plan to grow and maintain the camp for future generations. WE CANNOT TURN TO OUR FUTURE WITHOUT YOU! The “Sharing our Faith. Securing our Future” Campaign is looking to secure $250,000 by December 2020. These funds will allow Camp Lemieux to maximize its capacity as a Catholic Camp and in turn fill each of our camp offerings EVERY summer. 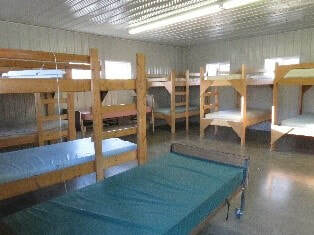 A higher number of campers will in turn generate the revenue for our future administration and capital costs. EXECUTIVE DIRECTOR: Securing the services of an Executive Director allows Camp the ability to respond to ever changing ministry and administrative needs bringing the “Sharing our Faith, Securing our Future” campaign to full fruition. The Executive Director will be instrumental in promotions and camp relations. Working alongside the board, the Executive Director will develop ongoing programing and formation opportunities as well as provide stability in fundraising and administrative tasks moving forward. BY 2020, the Executive Director role will be self-sustaining. MATTRESSES: Recent Public Health & Safety inspections encourage the replacement of all our mattresses as soon as possible. With the current mattresses between eight and ten years old they have reached the end of their life span. Replacing them ensures clean and comfortable beds are available for all those who attend Camp Lemieux today and in years to come. ​CAPITAL: Longer term capital improvements will take our camp into the next 50 years. Needed repairs include repairing our docks, replacing our boat house, and repairing / upgrading cabins to allow for more campers, wheelchair accessibility, and facilities that support our programming. Camp Lemieux’s “Sharing our Faith, Securing our Future” campaign..